With our expertise in the respective domain, we are engaged in manufacturing and exporting a wide range of Industrial Automation. The range we offer is manufactured in tandem with the set industry norms using latest technology. We ensure to test the final range stringently to make sure that products are durable and accurate in dimensions. With the assistance of our technical team, we provide customized products in numerous sizes and dimensions, meeting the demands of numerous industries. 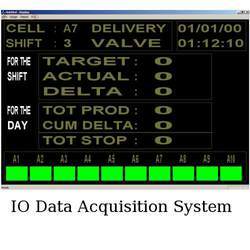 We are a trusted business name in the market engaged in offering optimum quality of IO Data Acquisition System. These are developed in strict tandem with the latest technological advancements using high grade raw material. This system uses open architecture standards in order to ensure easy development and deployment into existing and future systems. Besides, it helps in monitoring and controlling various applications, providing advantage at the existing network infrastructure. As per the requirements of our clients, IODAQ-I2R is available with various interfaces like Ethernet, RS232, and RS485.